Every two years, Bellefonte Borough elects about half of members of the nine-member council and every four years, we elect our Mayor. This year, five people were elected to four-year terms on council and one person was elected to a two-year term to fill a position that was vacated by a former council person. In addition, this was the year we elected our Mayor. Their terms start on Monday, January 1, 2018. But since January 1st is a national holiday, the county decided to hold the swearing-in ceremonies for the county-wide offices and for Bellefonte Borough on Friday, December 29, 2017. We hold his joint swearing-in ceremony at the same time because the county seat is located in our borough of Bellefonte. All of the other municipalities hold their own ceremony. I was sworn into office two years ago but decided to attend today’s ceremony in honor of my fellow colleagues. I was able to snag a front-row seat and was, therefore, able to record each of their oaths of office. The program started at 9 am. As people entered the courtroom, we were each handed this program listing all of the participants and the oath of office. There were six people sworn into county-level offices by the four currently seated judges on the Court of Common Pleas. Retiring Judge Thomas Kistler administered the oath of office to President Judge Pamela Ruest who retained her position for another ten years. She is the first female to have served as a Centre County Judge and is now the first women to hold the position of President Judge. Once she took her oath of office, President Judge Ruest administered the oath to everyone else. The county-level officials sworn into office include two Court of Common Pleas judges – one new (Brian Marshall) and President Judge Pamela Ruest as well our new District Justice Casey McClain (D), our new District Attorney Bernie Cantorna (D), and one new (Jason Moser (D)) and one re-elected (Hope Miller (R)) Jury Commissioner. District Attorney Bernie Cantorna (D) and his extended family at the swearing-in ceremony. Once the County-level officers were sworn in, the judges then swore in Mayor Tom Wilson and five of the six Bellefonte Borough Council Members. Evan Duffy, the individual elected to the two-year term was not present and will be sworn in at a later date. Newly Sworn-in Members of the Bellefonte Borough Administration. Left to Right: Council Member Jon Eaton, Council Member Michael Prendergast, Mayor Tom Wilson, Council Member Randy Brachbill, Council Member Melissa Hombosky, and Council Member Anne Walker. Meanwhile, here are videos of the Bellefonte members being sworn into office. Mayor Wilson (R) was sworn into his second term as Mayor. Prior to being Mayor, he had served as a member of the Council. The first member of Council to be sworn in was G. Michael Prendergast(D). He will join me in representing Bellefonte’s West Ward. This is his first term in public office. Following Mike, Anne Walker (D) was sworn in. She too is a first-time member of the Council and will also be joining me in representing the West Ward. Melissa Hombosky (D) was next to be sworn in. She represents the North Ward and this will be her first full four-year term; she was appointed to a vacated seat by the previous Council in the spring of 2016 and will now serve a full four-year term. Randy Brachbill (R), representing the South Ward, was next to be sworn in. He has served several terms on Council and most recently has served as Vice-President of Council. New officers will be elected out our first meeting on January 2, 2018. Following Randy, Jon Eaton (D) was sworn in. Jon is representing the North Ward with Melissa Hombosky. He is another first-time member of Council. Evan Duffy (R) will be sworn in on Tuesday, January 2, 2018, for a two-year term. He will be representing the South Ward and will be up for reelection in 2020. The remaining three members of Council who were not sworn in today will stand for re-election in 2020. They are myself (D) representing the West Ward, Doug Johnson (D) representing the North Ward, and Renee Brown (R) representing the South Ward. I’m looking forward to working with all of the members of Council—both male and female. Congratulations everyone! This morning (October 2, 2017), the local public radio station in Harrisburg, PA aired a program on universal health care, often called single-payer health care or Improved Medicare for All. They presented a debate between insurance industry members, legislators, and advocates for single-payer health care. Advocating for Medicare for All – a universal, single-payer healthcare program. Photo Courtesy of National Nurses United. The radio clip that I’m embedding below discusses HB 1688, the Pennsylvania Health Care Plan. This bill was reintroduced in the PA House of Representatives on Friday, September 29. It is a state-based universal health coverage for residents of Pennsylvania via a single-payer health care payment program which redirects Medicare and Medicaid funds into a single state funding program where 9 out of 10 people will have reduced healthcare costs and where you get to select your own doctors, healthcare providers, and hospitals. Decisions about treatment are made between the healthcare provider and the client. Rep. Delissio has been the prime sponsor of HB 1688 for the last three sessions of the PA General Assembly. Here’s a 2016 presentation on the Pennsylvania Healthcare Plan by Representative DeLissio on her bill. FYI, the bill number did not change between the current and last session. So when she talks about HB 1688, she is presenting essentially the same plan (with some minor tweaks). Where is Rep. Glenn Thompson? Not at the PA 5th Congressional District Town Hall Meeting in the Forum Building at The Pennsylvania State University today. Neither Representative Thompson nor any member of his staff showed up for the Town Hall Meeting that he was invited to in the 5th Congressional District in Centre County where he lives. This meeting was held during the February 2017 Congressional Recess when he was in the district. These recesses are designed to give Congressional members time to go home and “tackle constituent concerns” back in the district. Town halls are often used to help “tackle” these issues in an efficient, open and transparent way. When a Representative fails to set up a face-to-face town hall meeting, his/her constituents set it up for him/her and invite the Representative and/or his staff. This is what happened here in Centre County today. Since no representative from G.T. Thompson’s office, including Thompson himself, showed up to answer our questions, concerned constituents talked to his cardboard substitute. The meeting was taped and will be sent to him for his response. About 300 voters in Pennsylvania’s 5th Congressional District showed up at this town hall today to ask Rep. Glenn “GT” Thompson questions of concern. These issues included but were not limited to sexual assault, Title IX, education, immigration, gun safety, ethics, healthcare, disability, access to the representative, and open and transparent government. Here’s the full video of the Town Hall Meeting. The town hall meeting lasted about 90 minutes. But #WhereWasThompson? Where was he hiding? Was he avoiding his constituents? Mr. Thompson, or as you like to be called, G.T., you were hired (elected) to represent the entire congressional district. Not just those that you agree with. As your boss, we need you to answer our questions. We are not “paid activists” or “the political opposition” as you seem to think; we are your constituents. We want to hear from you now. We want to know what you think and why you are voting the way you do in Congress. NOW. Not months down the road. And we want your responses on record. Not behind closed doors. And isn’t it more efficient for our concerns to be heard at a town hall meeting? Especially since your offices are “overwhelmed” by the calls, letters, etc.? We as your constituents think so. Watch “Michael Moore in Trumpland”! This video cost $4.99 through either Amazon or iTunes but should be well worth the 70 minutes of showtime. And remember to vote and vote wisely on Tuesday, November 8, 2016. If you’re still on the sidelines when it comes to this election, or if you’re feeling conflicted about voting for Hillary, or if you love Michael Moore’s films and are a strong Hillary supporter, then I strongly encourage you to take an hour and 10 minutes right now and check out “Michael Moore in Trumpland”. No one else has made the unique and persuasive arguments Michael Moore is making in “Michael Moore in TrumpLand” — and you’ll want to hear what Moore has to say and share it with your friends and family. If you’re in need of a “pick-me-up” today, this is the movie for you. You can get it on iTunes here.Or you can get it at Amazon by clicking here.Both of them, are letting people buy it and OWN it (not just “rent” it) for under five bucks. The grand opening ceremony of the APRL at the Match Factory in Bellefonte was held this morning here in Bellefonte, Pennsylvania. About 15 years ago, the American Philatelic Society (APS) and the American Philatelic Research Library (APRL) purchased the Match Factory complex here in Bellefonte . When purchased, the Match Factory was a structure with extremely leaky roofs and walls. Over the last decade, the APS and the APRL took the time and effort to restore this grand, historic building. This morning, a ribbon-cutting ceremony was held to open up the newest section. It is a two-story research Library containing the largest set of philately research materials in the world. This slideshow gives you a quick picture of the speakers that were at the ceremony along with the crowd from around the country who came to help celebrate this great moment. I believe in every citizens’ right to vote. I believe in justice and opportunity for all. For our Fathers, Sons, and Brothers. … It’s the American Way. Words are very powerful. Sometimes, however, pictures are worth a 1000 words. Here’s one such video. Believe in yourself and your power as a voter. Get out and vote! Complete Video with audio 10-10-2016 from George Polisner on Vimeo. Civic Works -GOTV Video for 2016 -George Polisner and Muhammad Azim. If you or someone you know has been a victim of sexual assault, here’s something you can do. Yesterday, the Washington Post released a 2005 video of Donald Trump. In this video and news article, Trump, using lewd language where he essentially brags about sexually assaulting women. A few hours after the video was released, Trump released a classic non-apology in a statement, saying “I apologize if anyone was offended.” What he said was that he was sorry for others being offended by his language and behavior condoning sexual assault. Not that he was personally sorry for his offensive behavior. A few hours after that, he released a short video again “apologizing” saying, “I said it. I was wrong and I apologize.” I put apologizing in quotes because he then immediately segued into blaming the Clinton’s for abuse of women saying that they both abused women but he only used bad language. Video Courtesy of USA TV. So what can you do? If you are a survivor of a sexual assault or abuse OR personally know someone who has been assaulted or abused, please take a moment to sign the UltraViolet.org letter to Republican leaders, candidates, and elected officials. This has to stop. No “Assaulter in Chief!” Please sign this letter now! I am now an official member of Bellefonte Borough Council. This is a video of the swearing in at the Centre County Courthouse this morning. Judge Kistler performed the oath of office with my husband Joe Vasey standing next to me. 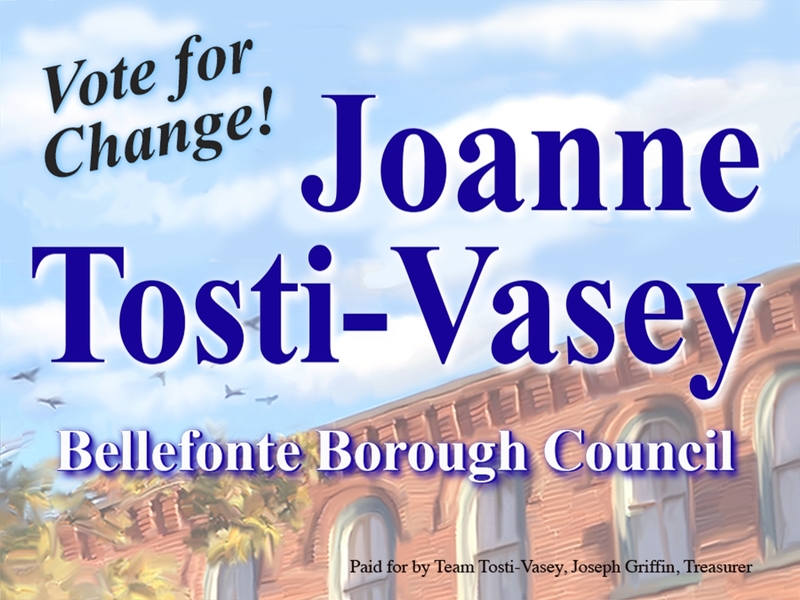 Joanne Tosti-Vasey’s yard sign. Created by local artist Mary Vollero. The former Garman Opera House is pictured in this sign. On May 19, 2015, I won the Democratic primary election for Bellefonte borough’s West Ward seat against a 32-year incumbent by almost a two-one majority. He won the write-in vote on the Republican ticket. So we are having a ” do-over” contest in the General election on Tuesday, November 3, 2015. I have been very active all summer and fall campaigning for this seat. Talking to local businesses. Attending house parties (the big Open House Party is being held this coming Sunday at a local art studio), door knocking, and putting out yard signs all around town. In addition to these direct contact events, I also attended a debate at the end of September held by the Centre County League of Women Voters. And answered their Voters’ Guide questionnaire that will be included in a county-wide voters guide that will be sent to the public about a week before the November 3rd election. Then on October 11, I was interviewed by Jeremy Hartley, a reporter for the Centre Daily Times. We discussed how my campaign is going, my background and thoughts on major issues for the town, parking in Bellefonte, development of the downtown and waterfront areas of town, attracting residents and investors, affordable housing, and the budget and expanding the tax base. The video of this interview was taped by C-NET, our local cable television station. C-NET gave me permission to distribute this tape. So here it is for your viewing. Take a few minutes to hear what I had to say and why I’m running for borough council. If you are local and want to learn more about me in a fun venue, come to Mary’s Open House on Sunday, October 25. And then come out and vote for me on November 3 if you live in Bellefonte’s 3rd Ward. Regardless of where you live, you can also volunteer/donate – email me at tosti-vasey@pobox.com and we’ll fit you in! Bellefonte Pennsylvania was the first town in America where human slavery was forbidden. Even though the law of our land was still that people who were slaves, and were identified as such, were to be returned to their owners. This town did not break any laws even though the slaves, or former slaves, in Bellefonte had no fear of being sent back. As a result of this early anti-slavery movement in Centre County, Bellefonte became a home for former slaves and freemen. And a community grew up and around a Black church community that became known as the Saint Paul AME (African Methodist Episcopal) Church. 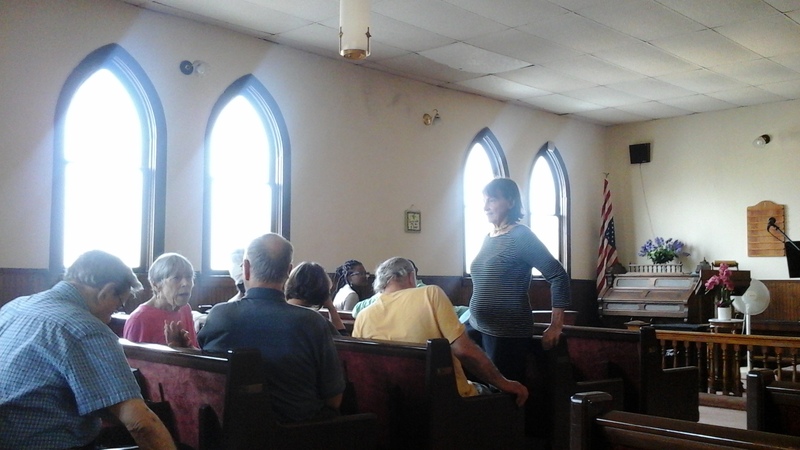 It is a church associated with the Underground Railroad during the Civil War and with the Mills Brothers and their family during the early part of the 20th Century. According to RootsWeb, Saint Paul’s AME Church was established in 1859 through the merger of two other religious houses. The first house was originally founded in 1836 by Samuel Johnson of Chambersburg, Pa. It was known as Zion’s Wesleyan A.M.E. church. The second one was created in 1844 by the Rev. Willis Nazery and was known as the A.M.E. congregation. In 1859 these two merged; they built a church on land donated by a Quaker named William Thomas. With its Quaker roots, Bellefonte has long been a place where people of different races and backgrounds could live and work side by side. From about 1818 until the Civil War, Bellefonte was a stop on the Underground Railroad and several homes [as well as St. Paul’s AME Church] in the town have now been identified as being former safe houses for runaway slaves. In the late 1820’s, the ancestors of the Mills family escaped slavery in the South on the Underground Railroad. Upon arriving in Bellefonte, they decided to stay rather than continue on to Canada. Of their four sons, Lewis and Edward Mills, joined the Union Army’s Colored Troops and fought in the Civil War. Lewis’ son, William Hutchinson Mills (b. 1847, d. 1931) was to become the singing Mills Brothers’ grandfather. ….In 1872, the great black abolitionist and orator, Frederick Douglass, visited Bellefonte to speak at a fundraiser. While there, he had his hair cut by Williams H. Mills. Douglass was, perhaps, the inspiration for William H. Mills and the other officers of St. Paul’s AME Church to persuade the Bellefonte school board to integrate their schools, in 1885. This history of concern for civil rights and music continues to the present. The current pastor of Saint Paul’s is Dr. Donna King; she is an Instructor in Black History and Women’s Studies at Penn State University and is a visiting researcher at the Dickinson School of Law who describes herself as an activist. Saint Paul’s church is now, however, in serious disrepair and needs some help and tender-loving care. Our community – both members of the church and community members at large – are now pulling together to save both the congregation and this historic building. The heating system needs to be replaced. Oil needs to be purchased for the winter. Leaks in the roofing need to be repaired. 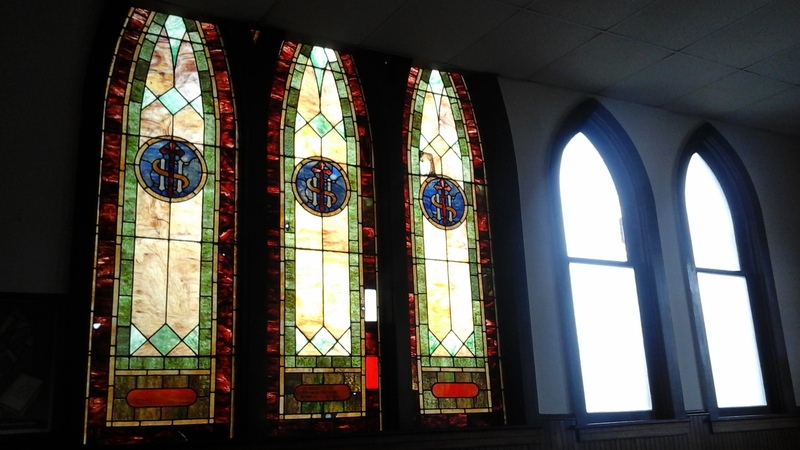 The stained glass has some broken spots that need to be fixed. And that’s what I could either see or heard about; I assume there is much more. Band Burrage holds a benefit concert that includes music by the Blues Brothers at Saint Paul’s AME Church in Bellefonte, PA. This shows the south side of the church’s interior. Members of the Bellefonte, PA community gathering inside Saint Paul’s AME Church for a benefit concert to help restore the church. This shows the east side of the church. Showing financial community support will help obtain necessary historic grant funding to fully restore this historic gem. So on Saturday, September 26, a fundraising afternoon was held. A silent auction was held along with the serving of a soul-food luncheon. But the big event was a free concert by Band Burrage paying tribute to The Mills Brothers; his group was joined by a gospel group from Penn State University. 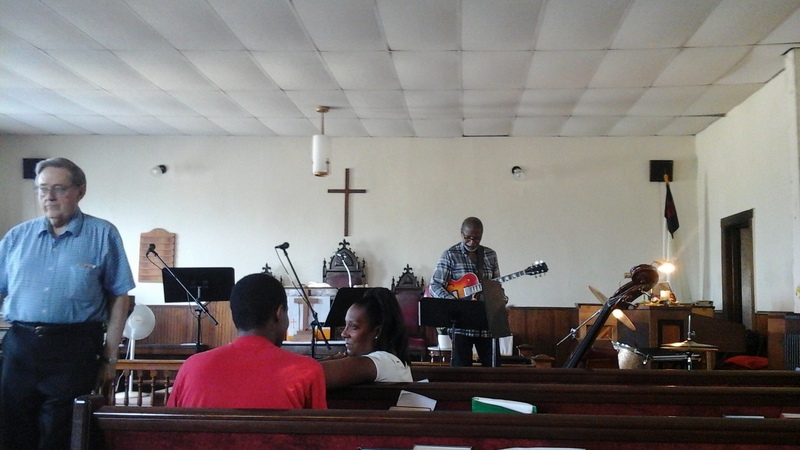 This concert helped bring in many community members to see the church to see and hear about its history associated with the Civil War civil rights and equality. I attended the concert and taped it so that you could get both a feel for the church interior as well as the music in our community. Here are the three videos that I made. If you are so inclined, please help our community save this historic civil rights and musical heritage landmark. Donations can be made at gofundme.com/stpaulbellefonte. Once again, donations to help preserve this piece of history can be made at gofundme.com/stpaulbellefonte. Thank you!